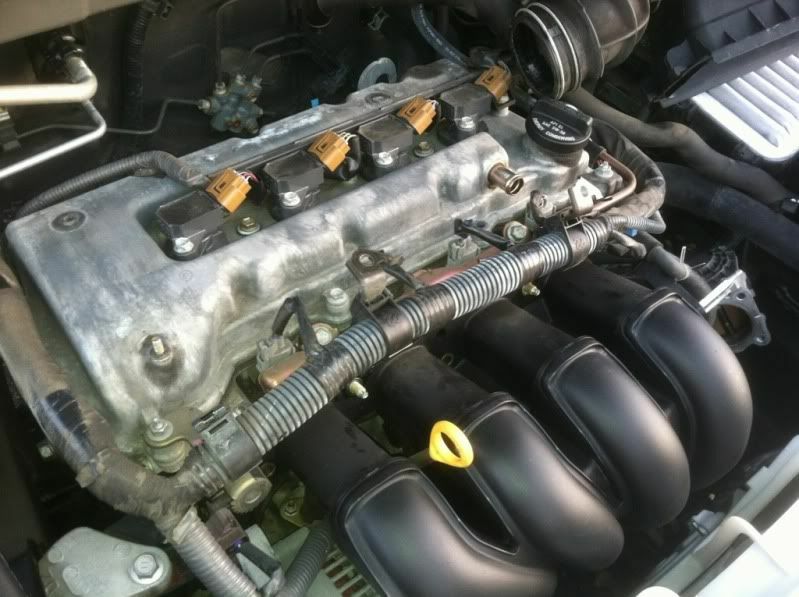 Toyota Nation Forum : Toyota Car and Truck Forums > Toyota Passenger and Sports Car Forums > Corolla and Matrix Forum > Corolla 9th Gen/1st Gen Matrix (2003-2008) > DIY 2003-2008 Corolla, Matrix, Pontiac Vibe Intake Gasket replacement with PICS!!!! 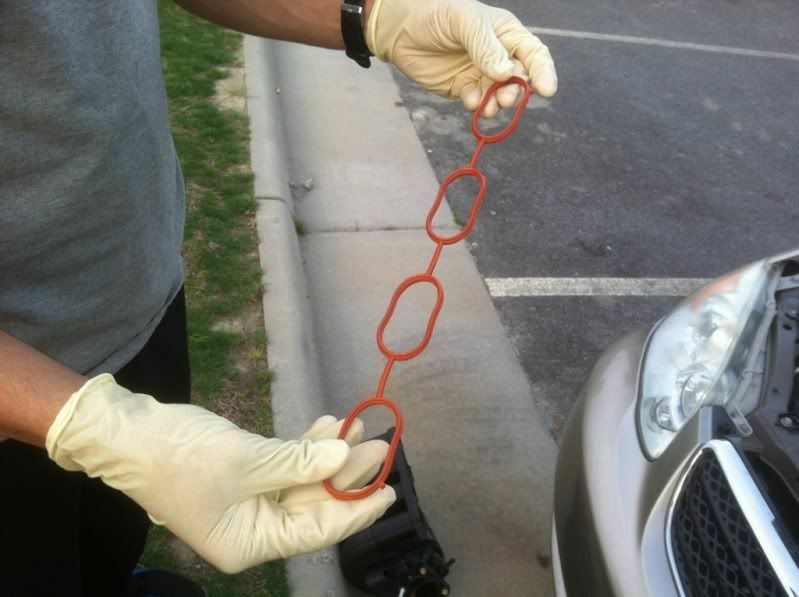 DIY 2003-2008 Corolla, Matrix, Pontiac Vibe Intake Gasket replacement with PICS!!!! Well I am up here in Virginia for a little while and it's been pretty cold. The past few days my idle has been very low and I knew my original intake gasket had run its course (104k is alright with me). 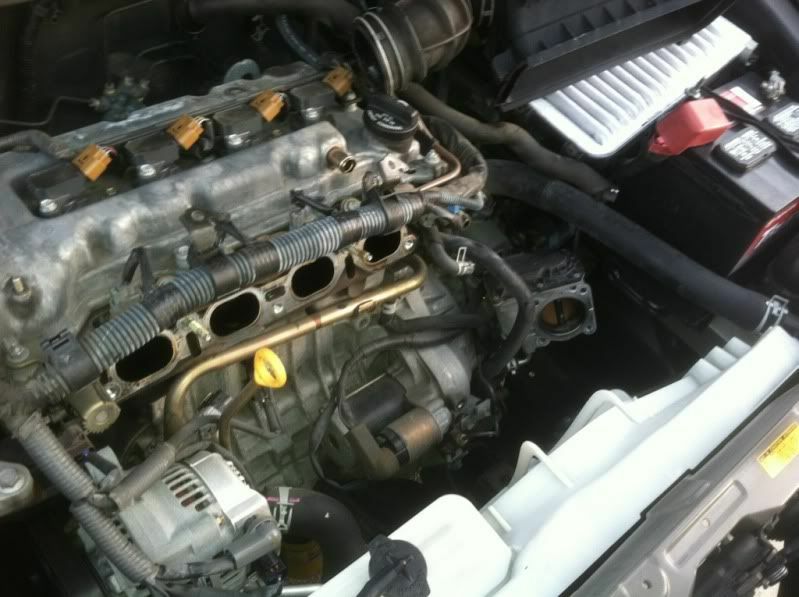 So I headed over to Priority Toyota and spent around 7 bucks and change to get an updated orange intake gasket. This DIY will work for all 2003-2008 models with only a few slightly differences for 2003-2004 models. 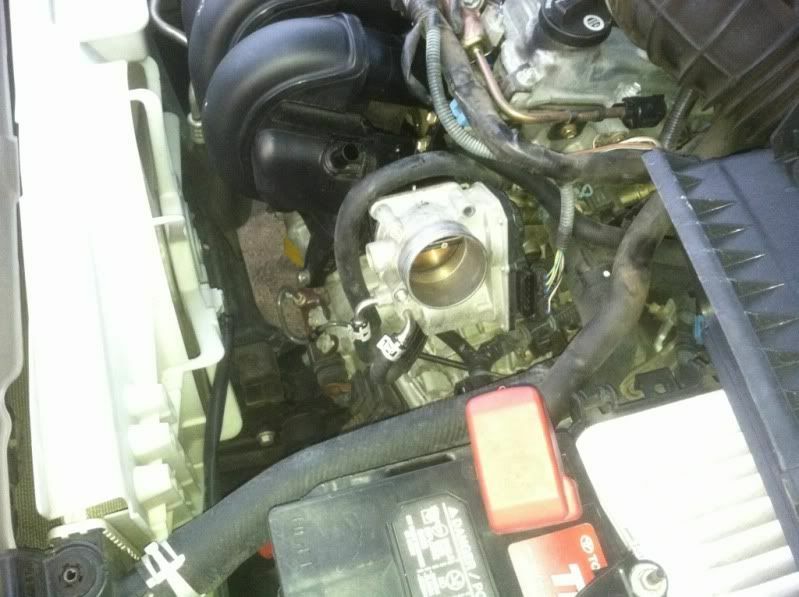 Those different steps are mostly centered around the throttle body and an extra support bracket between the intake manifold connecting and the throttle body. I have now added the steps for 2003-2004 models into the DIY. I would like to give credit to forum member shatterpulse for his images on the 2003-2004 stuff. Disclaimer: Myself or ToyotaNation are not responsible for any damage or injury that may result from use of this DIY. All vehicles should be diagnosed and repaired by qualified technicians. Proceed with this DIY at your own risk. 1. Secure parking brake and then secure hood in open position. 2. 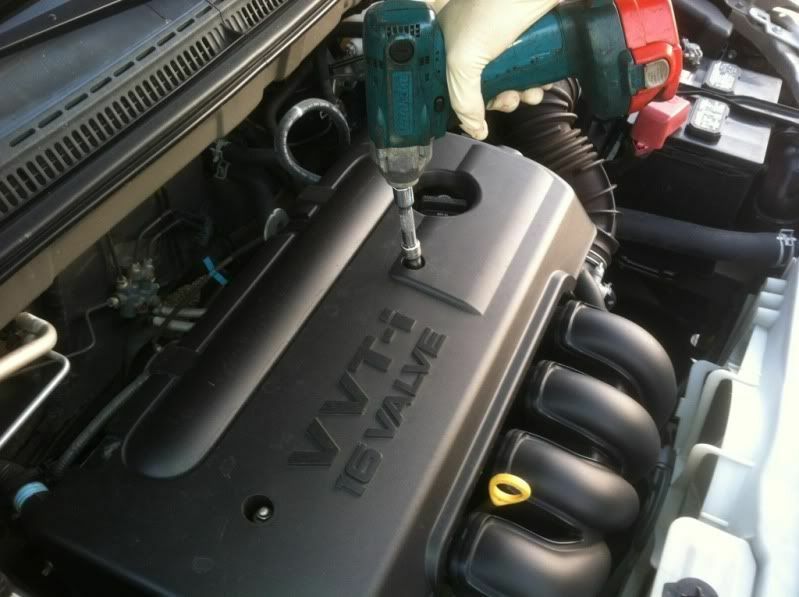 Remove the engine cover. 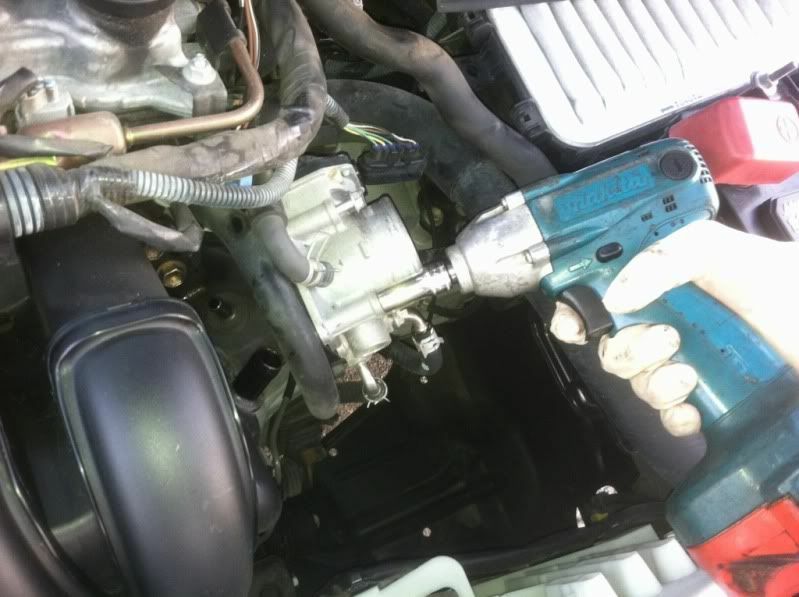 Using your 10mm socket and ratchet, remove the 10mm nut, loosen the 10mm stud nut, and remove the two plastic clips if you have them and remove the engine cover. Note: The two rear plastic clips regularly get lost/break. I replaced mine with two M6x1.0 bolts with a 10mm head. Much nicer. Note: Occasionally the 10mm nut will come of the valve cover/engine cover stud. However this almost never happens and the nut will loosen the entire stud as a "stud-nut" referred to above..
3. 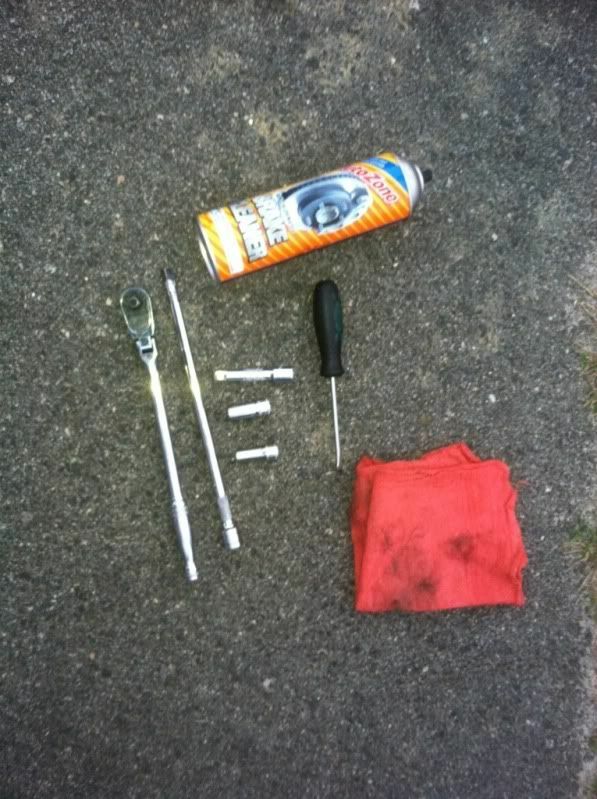 Remove and set aside the air cleaner and hose. 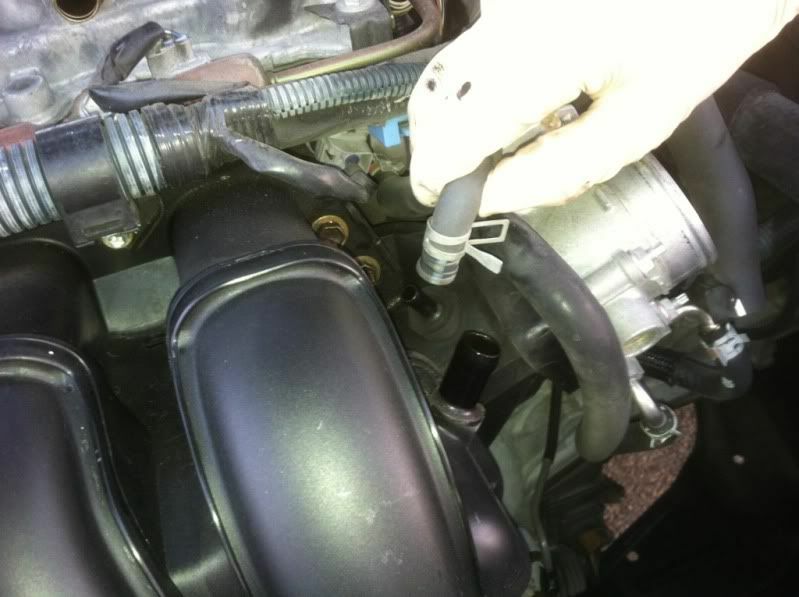 Loosen the 10mm hose clamp for the throttle body and remove the PCV breather hose by pulling it straight off. It should come right off, but if it doesn't press the clamp and lower it on the hose and use hose pliers to twist off the hose. Unclip the air box lid and set the air box with PCV and intake hose to the side. 4. 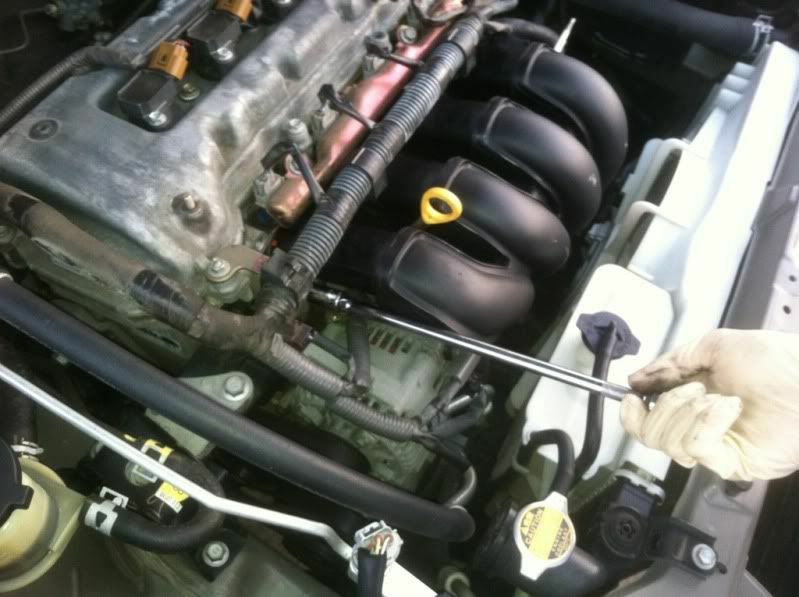 Remove the vacuum and breather hoses from the top of the intake manifold by pulling them straight off. They should come right off, but if they don't press the clamp and lower/raise (depending on perspective) it on the hose and use hose pliers to twist off the hose. 5. 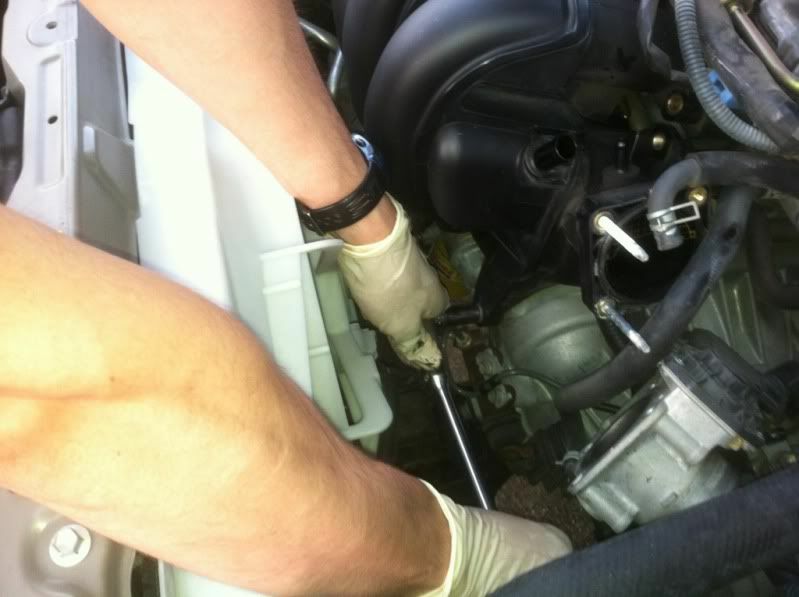 Remove the electronic throttle body connectors. 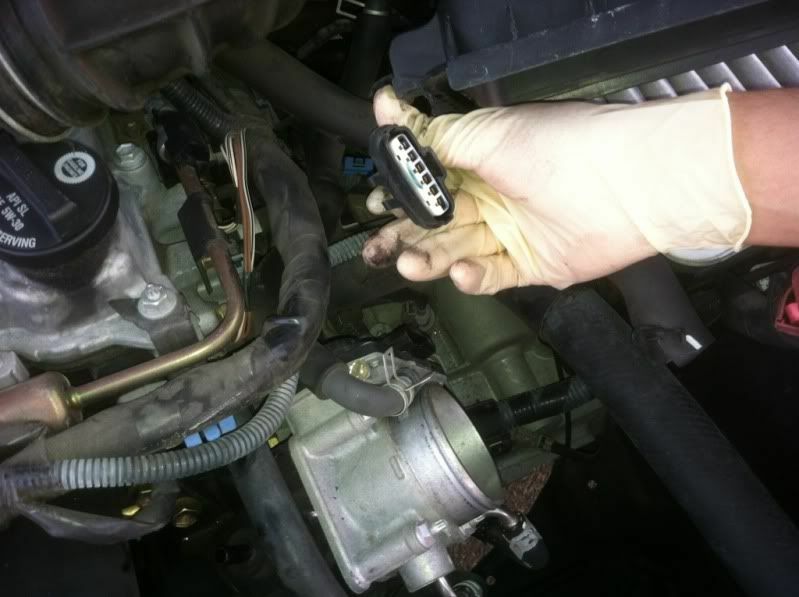 Push the center connector release and pull off the connector for both the upper Throttle Position Sensor (TPS) connector and lower Idle Air Control Valve (IACV) connector. 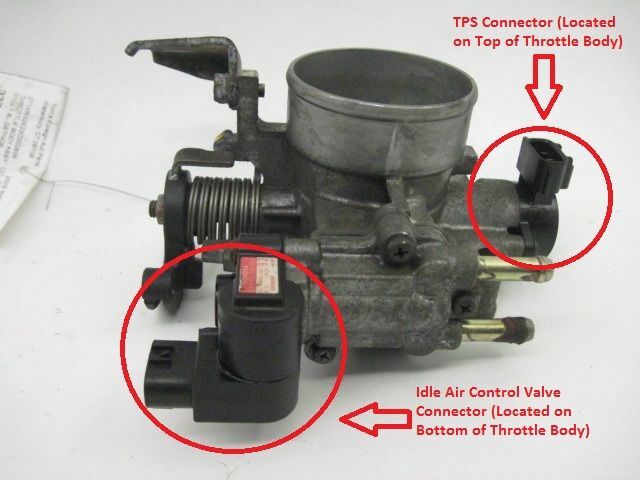 Push the center connector release and pull off the connector for the drive-by-wire (DBW) throttle body assembly. 6. Remove the throttle body. Using your 12mm socket and ratchet, remove the two 12mm nuts and two 12mm bolts securing the throttle body to the intake manifold. Then remove the one 12mm bolt securing the lower throttle body bracket to the the lower part of the intake manifold (the other part of the bracket is secured by a lower throttle body bolt). Remove the throttle body support bracket. Finally using your 10mm socket and ratchet remove the two 10mm bolts securing the upper throttle body support bracket to the intake manifold (Manual Transmission Models Only). Remove the lower throttle body support bracket and set it aside. 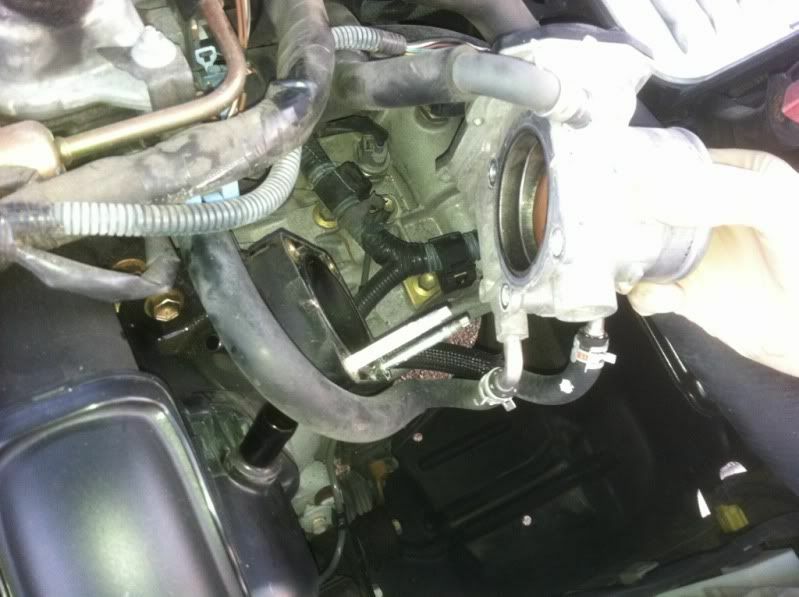 Pull off the throttle body and while routing the cooling lines away from the studs in the intake manifold, hang the throttle body. 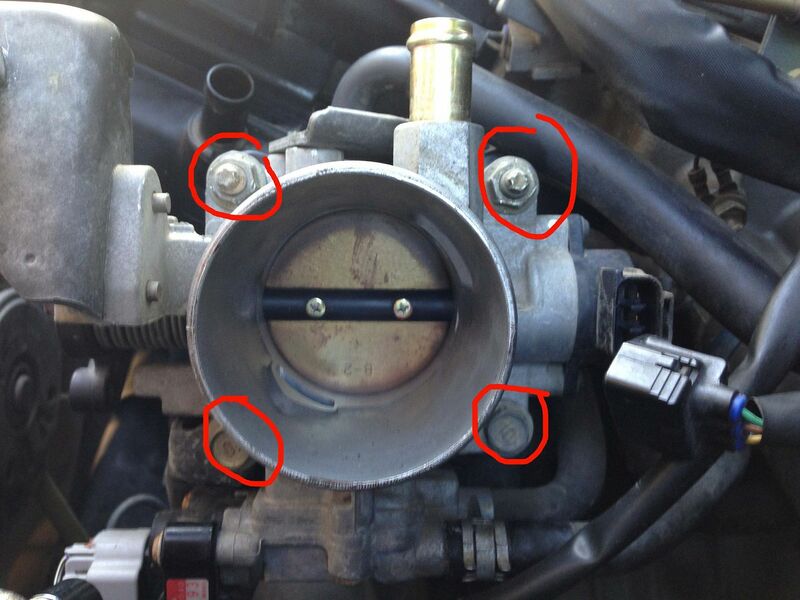 Using your 10mm socket and ratchet, remove the two 10mm nuts and two 10mm bolts and pull off the throttle body. Route the cooling lines away from the studs in the intake manifold and hang the throttle body. 7. 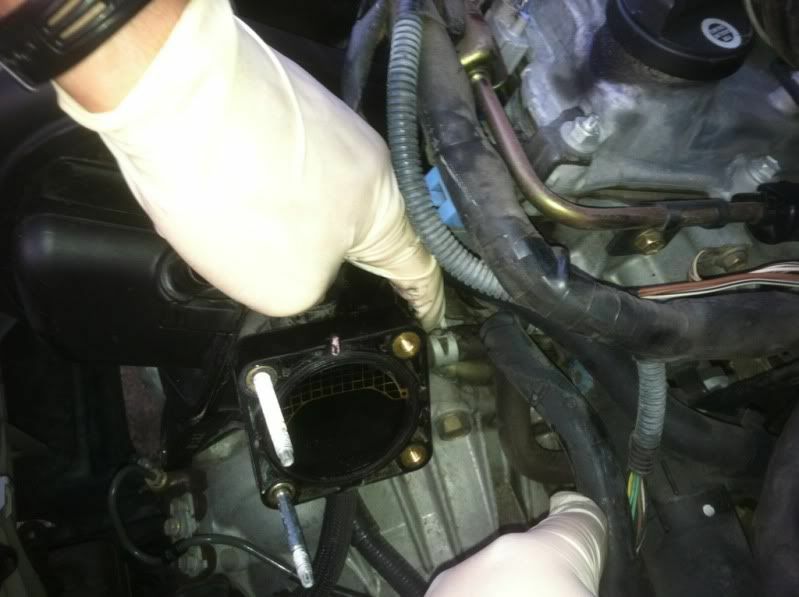 Remove the intake manifold wiring harness clip. Using your screwdriver release the catch and remove wiring harness clip from above the alternator. 8. 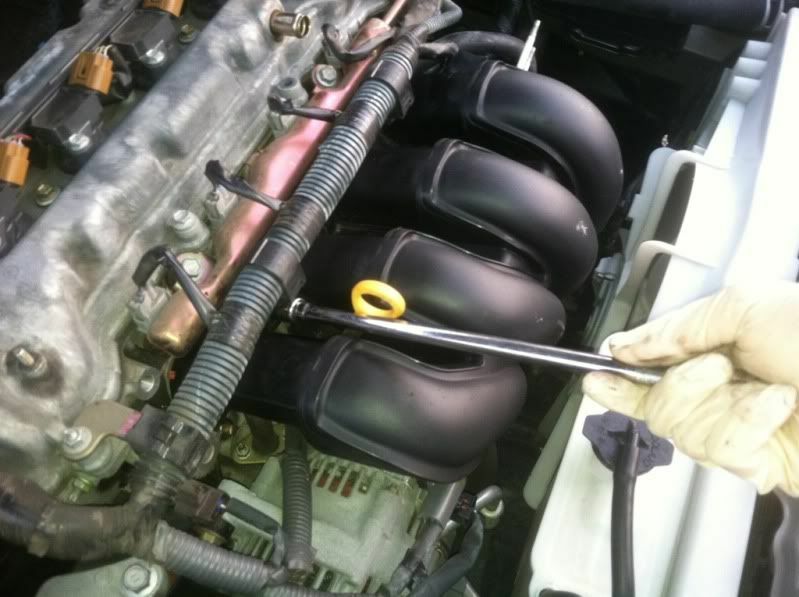 Remove the intake manifold bolts. 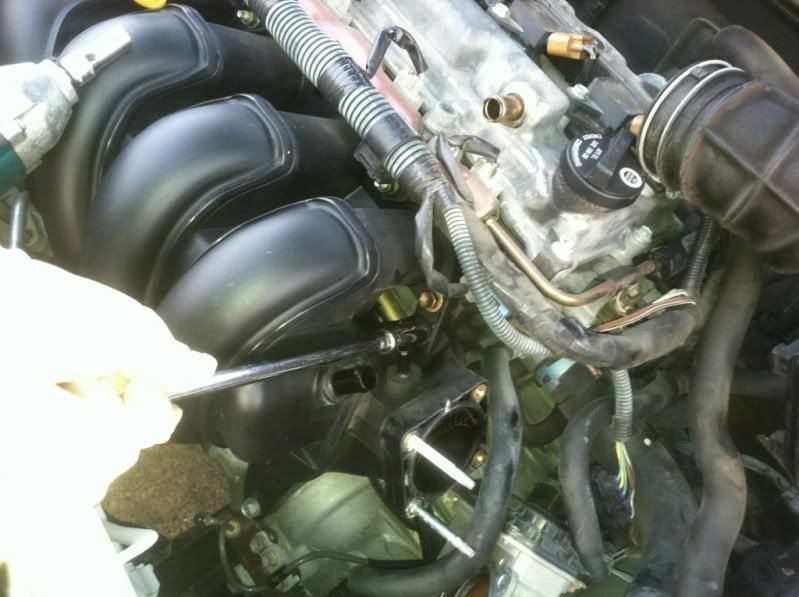 Remove the two 12mm bolts on the bracket located on the right side of the intake, two 12mm nuts holding the wiring harness retainers, and two remaining 12mm bolts from the intake manifold. Remember where each bolt/nut came from. 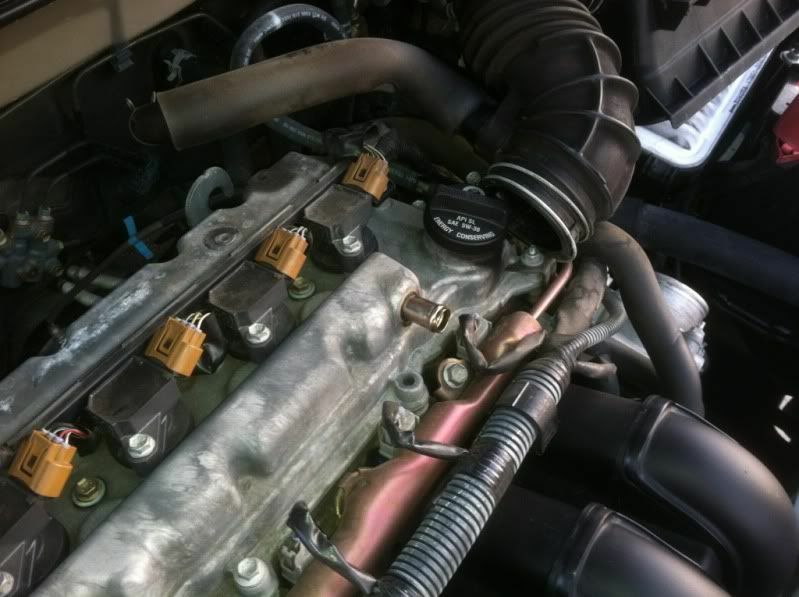 Remove the one 12mm bolt near the bottom of the intake, two 12mm bolts on the bracket located on the right side of the intake, two 12mm nuts holding the wiring harness retainers, and two remaining 12mm bolts from the intake manifold. Remember where each bolt/nut came from. 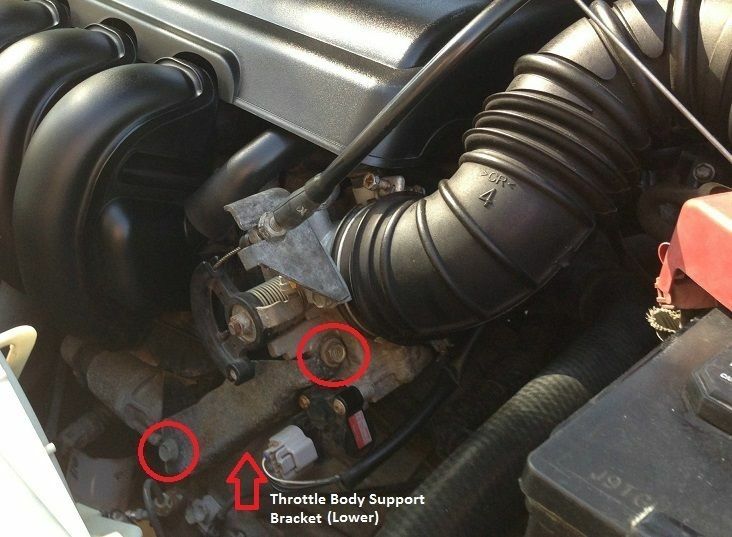 Caution: Remember the orientation of the small bracket closest to the throttle body. It should go back on the same way it came off and uses two different length bolts to secure it. Note: The only difference here between 2003-2004 and 2005-2008 models is that the lower bolt has already been removed on 2003-2004 models. 9. 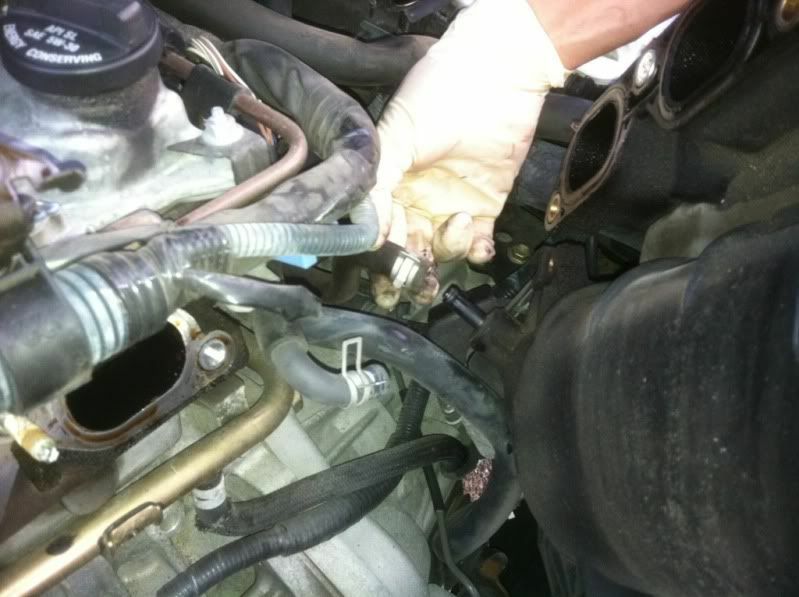 Remove the wiring harness from the intake manifold by pulling back the two wiring harness retainers (from around the nuts), flipping them around and moving the wiring harness out of the way. 10. 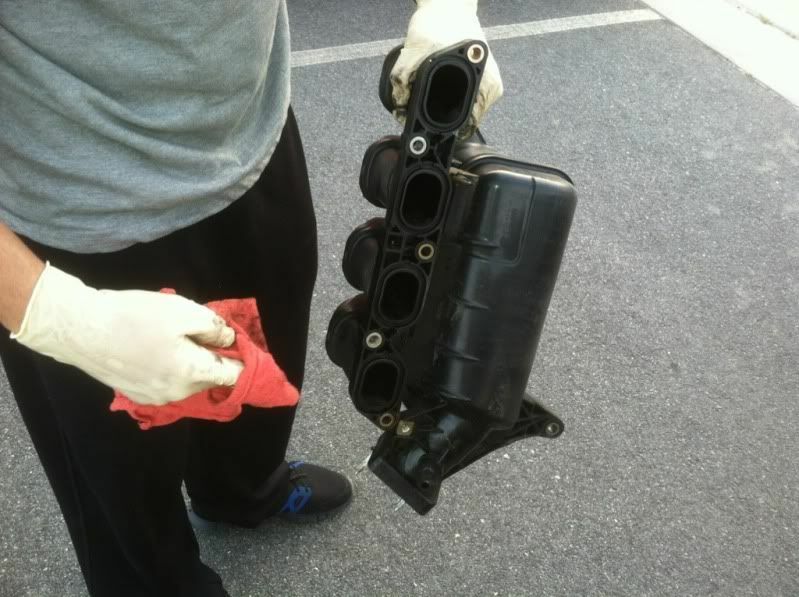 Remove the intake manifold by pulling it back and out off the studs. Caution: When removing take note of the hidden vacuum line behind the intake and remove it. 11. Remove the factory intake gasket. This is what caused the whole issue. 12. 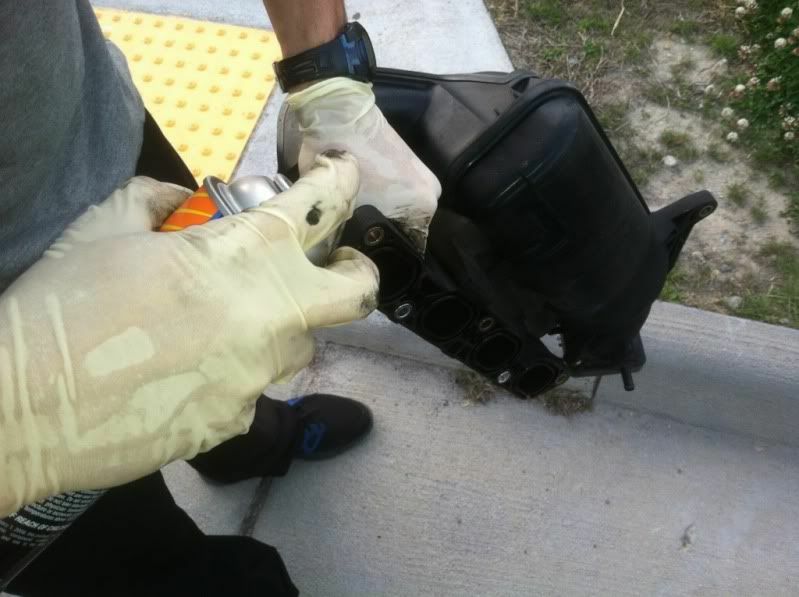 Using your brake clean and rag clean the face of the intake manifold and cylinder head. 13. Install the new intake gasket. 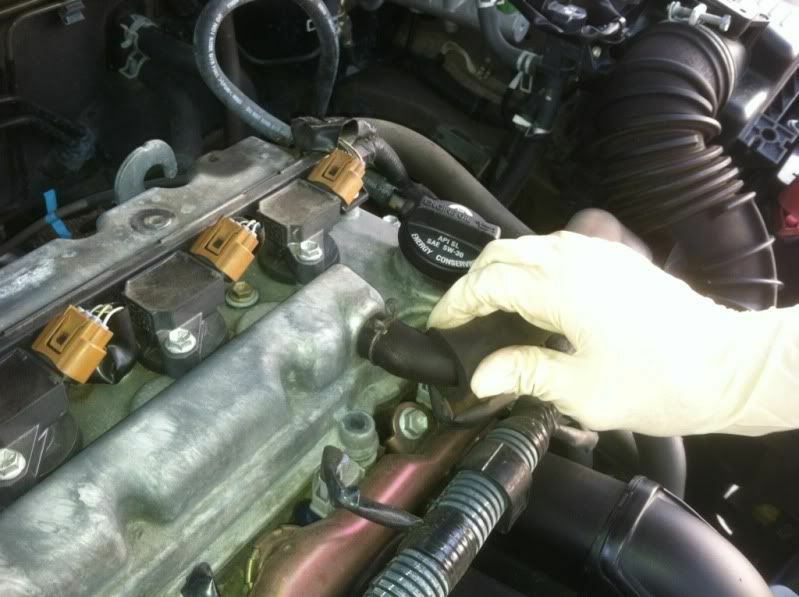 Make sure the indents line up and seat the gasket flush with the manifold. 14. 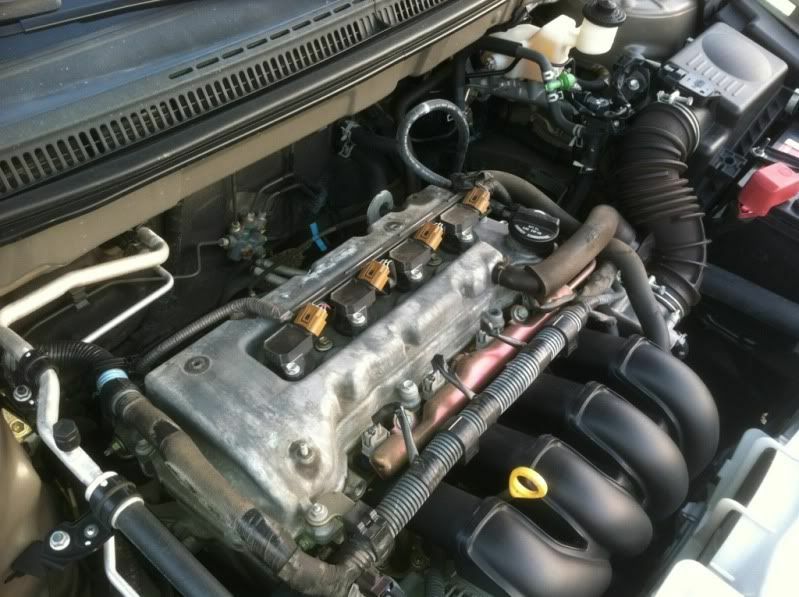 Install the intake manifold on the cylinder head. Reinstall the two wiring harness retainers around the studs, and on the clip above the alternator. 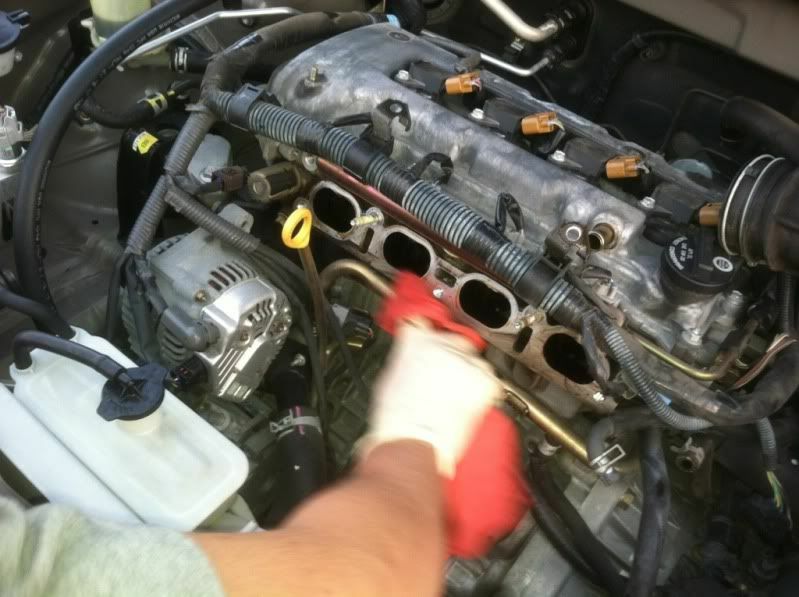 Install the intake manifold on the cylinder head. Reinstall the two wiring harness retainers around the studs, and on the clip above the alternator. 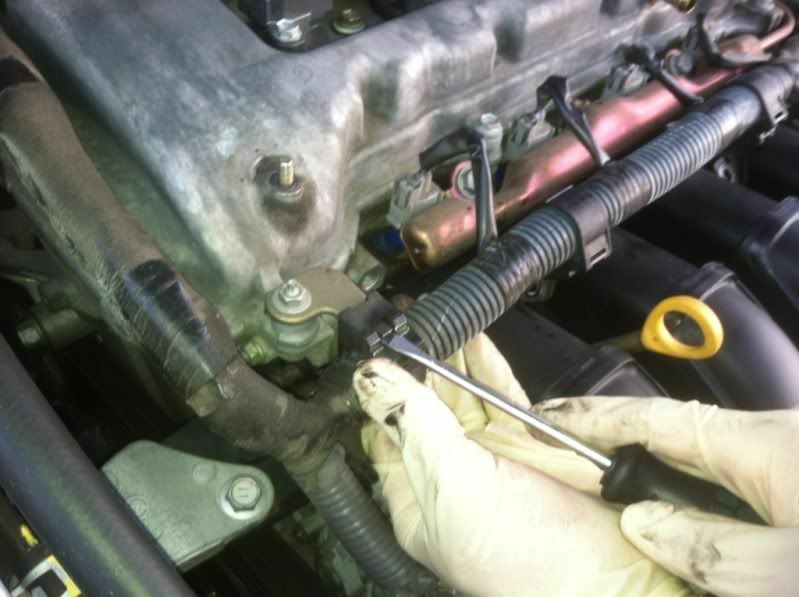 Using your 12mm socket and ratchet, install all the 12mm bolts and nuts in their proper locations. 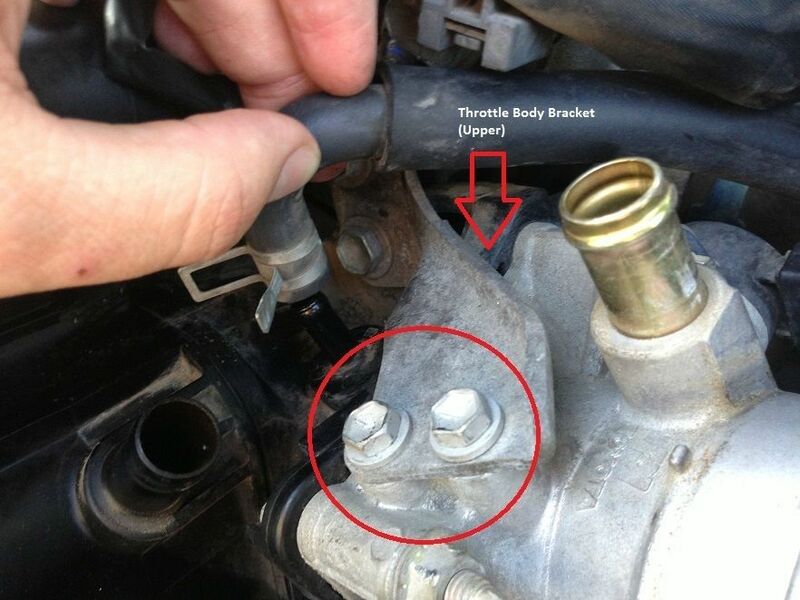 Make sure to leave the bolts for the small bracket near the throttle body loose, the bracket installed in the correct orientation, not to install the bolt at the lower part of the intake manifold yet. Using your 12mm socket and ratchet, install all the 12mm bolts and nuts in their proper locations making sure to reinstall the small bracket near the throttle body in the correct orientation. 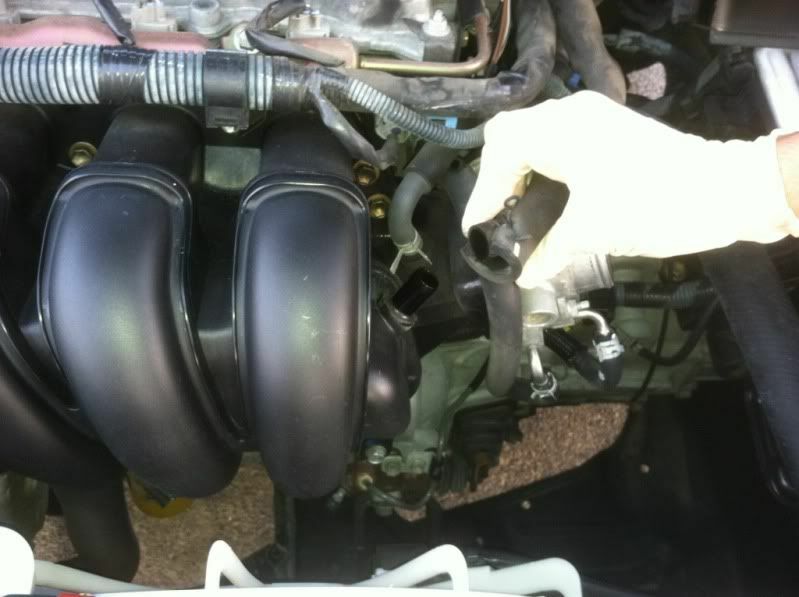 Don't forget the hidden vacuum line behind the intake manifold from the removal procedure. Be sure to install it now. I installed all bolts and nuts hand tight with my ratchet but have done around a bunch and never had an issue. This is my personal car too. 12mm bolts - 22 ft lbs. 15. Reinstall the throttle body. 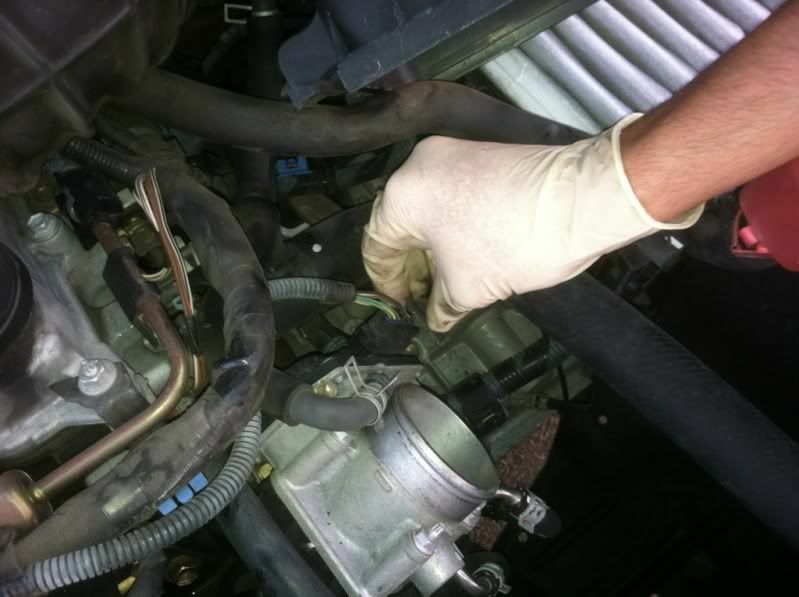 2003-2004 models: Clean the throttle body and reinstall or just reinstall the throttle body. 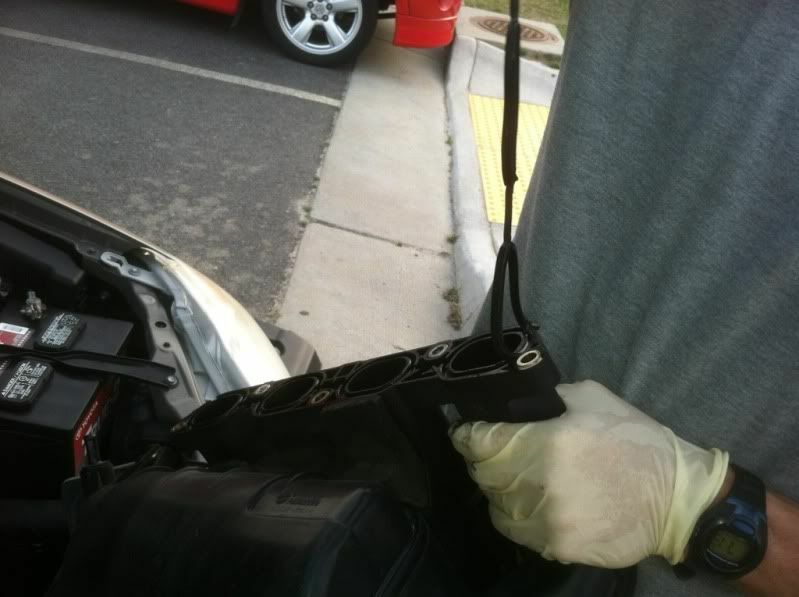 If replacing the throttle body gasket, pull it off and do so now. 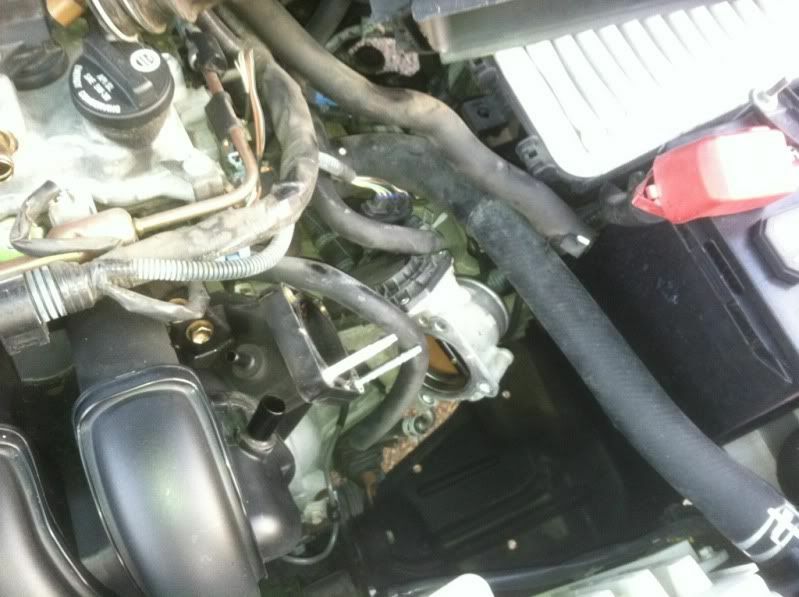 To install first place the throttle body into position over the studs. Then slip the lower throttle body support bracket over the lower left throttle body stud (closest to the throttle cable). Thread the two 10mm bolts securing the upper throttle body support bracket into the throttle body finger tight. Thread on and tighten the two 12mm nuts and 12mm bolts securing the throttle body to the intake manifold. Tighten the one 12mm bolt securing the throttle body support bracket to the lower intake manifold. Tighten the two 12mm bolts securing the upper throttle body support bracket to the intake manifold. Finally tighten the two 10mm nuts securing the upper throttle body support bracket to the throttle body (Manual Transmission Models Only). 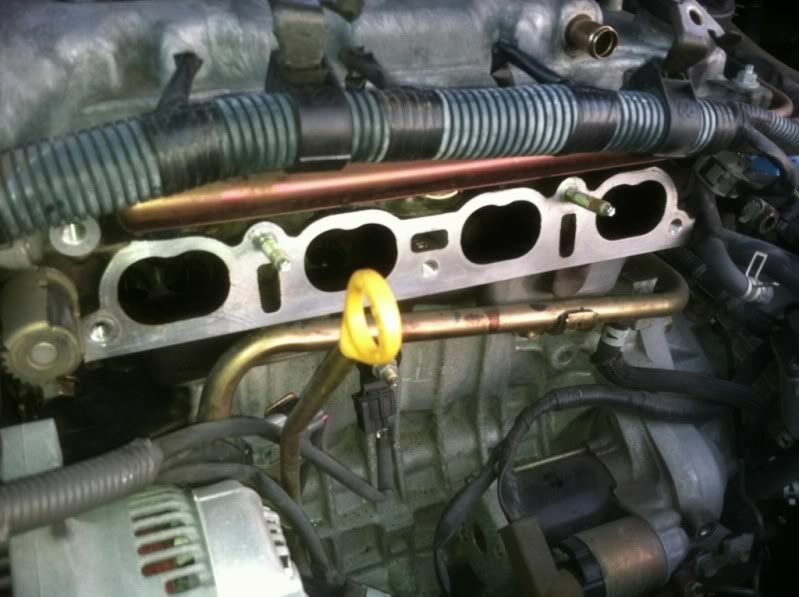 Note: Remember to route the cooling hoses around any dipsticks or studs that may get in the way. 10mm bolts (Manual Transmission Models Only) - 9.6 ft lbs. 12mm bolts/nuts - 22 ft lbs. 16. 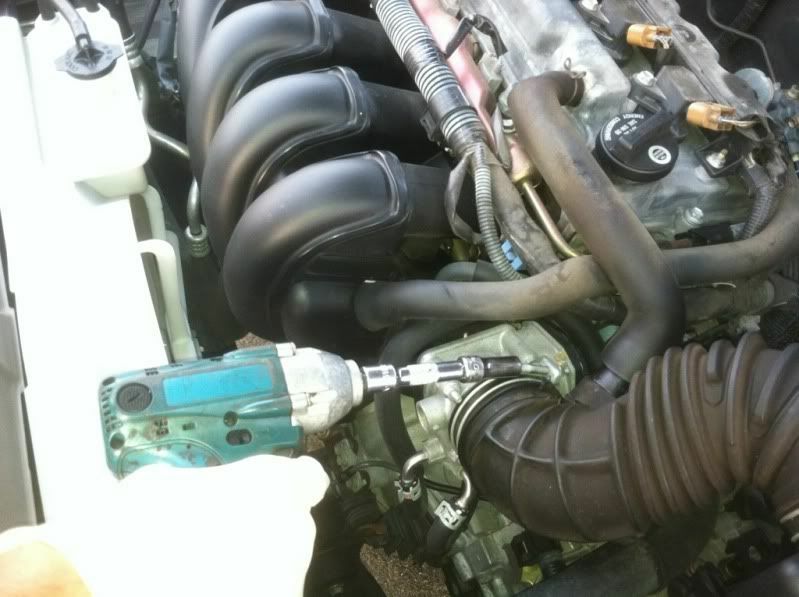 Reinstall the two vacuum lines on top of the throttle body. Note: Make sure the hose retainer clips are in the proper position. 17. Reinstall the air cleaner assembly and PCV breather hose. Note: Make sure the hose retainer clip is in the proper position. 18. Reinstall the engine cover. Note: If you lost/broke your clips install your new M6 x 1.0 bolts now. 19. Start the engine and verify you have no vacuum leaks. And it idles properly. 20. Be amazed at your work. Hope this helps. My car idles like new again. dpippin, JoeAllie, Peter J. and 1 others like this. Last edited by CARninja; 10-23-2012 at 09:30 PM. Thanks for the write up. Man you have it clean under the hood. I changed my gasket this summer. A clean engine is a happy engine. I clean both all my engines when I wash my cars. Yeah, especially before working on it. Sometimes, you have to work in somebody else's dirty engine bay... Very nice DIY, hartopted72. Also, congratulations on being named a Moderator. Your integrity is truly legendary. Last edited by invader; 10-24-2012 at 02:48 AM. Also, congratulations on being named a Moderator. Your integrity is trully legendary. Thanks again (BTW they are taking applications. Just read the sticky at the top of the forum). And that is very true. When I worked at the dealer, if you purchased my recommendations I would personally wash the car and clean the entire engine bay. Sometimes it would bite me if it was a Sienna or CrewMax Tundra though lol. I have to ask you why you did this. I have a P0171 code on my 07 Corolla. One possibility for this code is an air leak around the intake gasket. Is that why you changed it? Were you able to somehow identify an air leak around this gasket? This defective part will cause a P0171, as well as P0300-304 misfire codes. 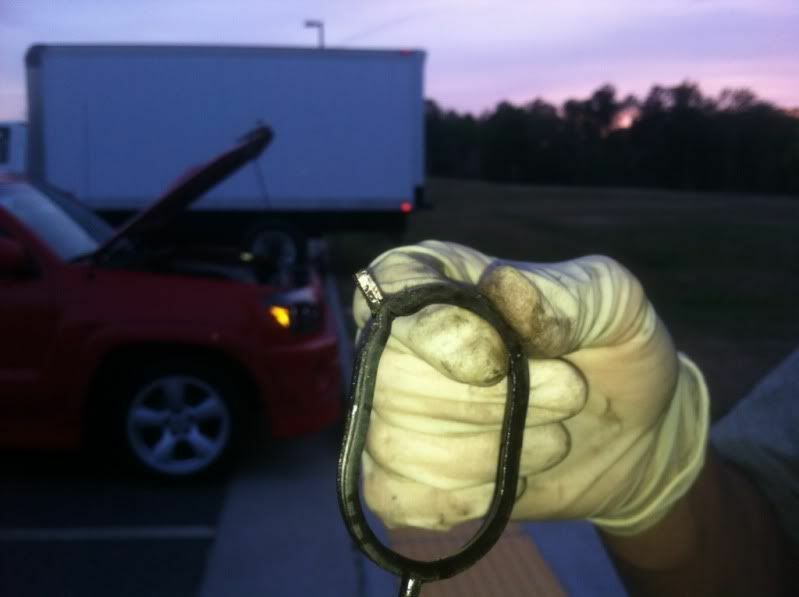 The gasket melts and leaks causing rough idle and sometimes the above codes. Mine had a rough idle so I replaced it. Had I let it go longer those codes were sure to come. This is a known issue and I am confident all gaskets will fail at some point. Great write up! Congrats on the Moderator status! Your knowledge is appreciated on here by all that read. Having recently been through this on an 03, I can say that the procedure works fine there as well. It's a pretty straight forward job. One caution I would add, is to pay attention to the shiny metal cylindrical inserts between the manifold and the studs (not sure what Toyota calls them; sleeves, spacers?). Make sure all of those metal sleeves are in place on the manifold, before re-fitting the manifold on the studs. In your photos, all of the sleeves stayed in the manifold, when I was swapping manifolds, a couple of the sleeves fell out of the manifold during the swap. 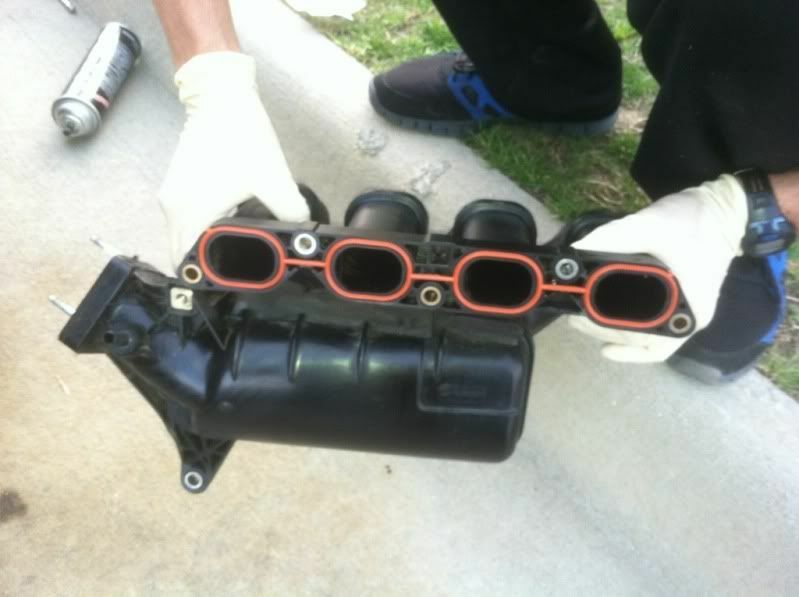 If the manifold is reinstalled without all of the sleeves, it could create problems. Very nice writeup and photos. Great addition to the forum. In other forums, I've seen posts like this become "Sticky Threads" or put in some other permanent reference section. Does this forum have something similar? Never mind, just found the DIY thread. What part of VA were you/are you in? I'm in south central VA. Nice time to visit and enjoy the fall colors. Thanks. I read about this gasket in a few places. My car idles fine. I am checking gas mileage now, but my sense is that it is going to be fine. I know the part is cheap and I could do this myself, but I am not ready to believe this is the problem that I have. I was in Ft. Lee area. Good note to add. I have done tons of these and never had an insert fall out. But I guess I see the possibility. Good info to add. Mine's been idling around 500rpm which I can feel vibration through my steering wheel, etc. Might have to do this soon! After 421,000 km's on my '05 S I started getting the P0171 codes. Had the dealer replace the intake gasket and the code went away. This write-up would have saved me some cash, though I don't remember them gouging me too bad for it. This would be my exact thought. 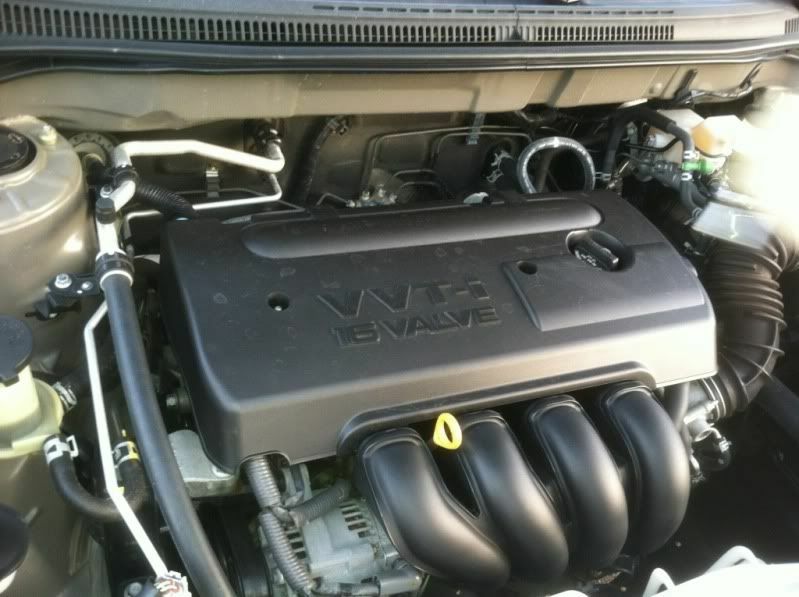 If the intake gasket is causing vacuum leak, I would suspect at least a lean code like P0171.